Have you ever been excluded from a social circle, and suspected that it might have something to do with your social skills? 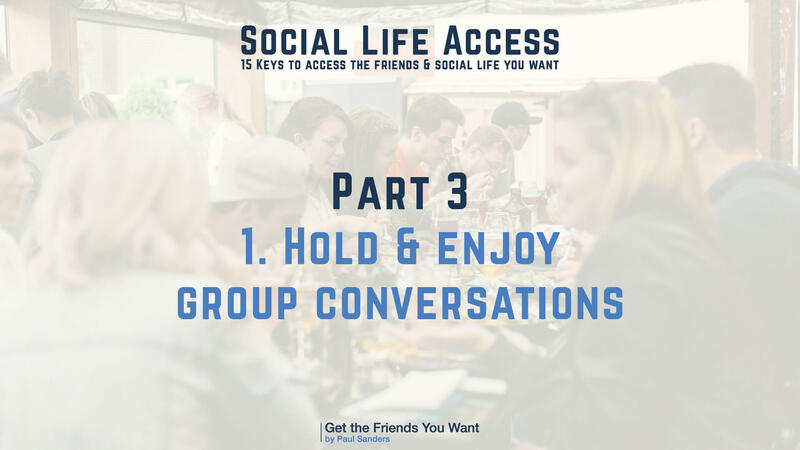 …have you ever wondered if there is a secret code that allows some people to have access to social circles, to friends, and to a great social life… while others stay out? Have you ever thought that if you could only join the right group of friends, you’ll have more friends than you’ll need for the rest of my life? Have you ever thought that maybe if you changed your wardrobe or your attitude or if you had more money… you would have more, and better, friends? Have you ever secretly thought that maybe if people weren’t so superficial, naïve, judgemental, selfish and uncaring… that you’d be more successful socially? Have you ever thought that you need to have friends in order to meet other new friends… and you didn’t have any, so you felt stuck? Have you ever developed a reputation of a loner… and thought that maybe it’s too late, that everybody already sees you as “that quiet one,” and that you could do nothing to change that? 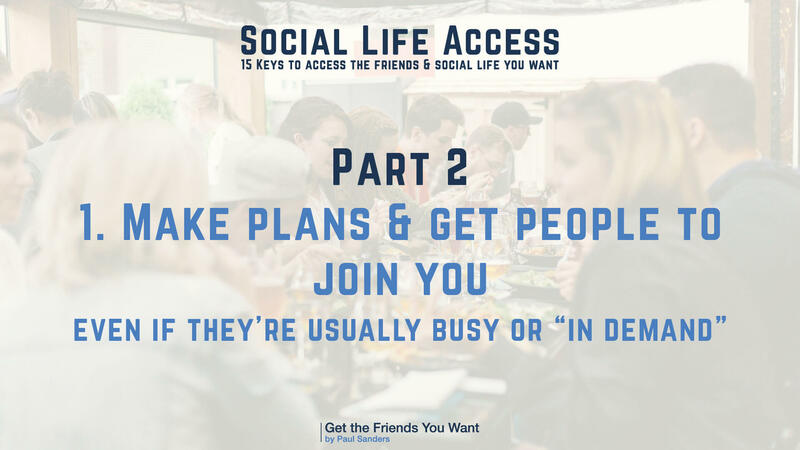 …have you ever found that the moment YOU stop doing all the work of calling, texting, staying in touch and making plans… your social life grinds to a halt? Because no one else was making that same effort? 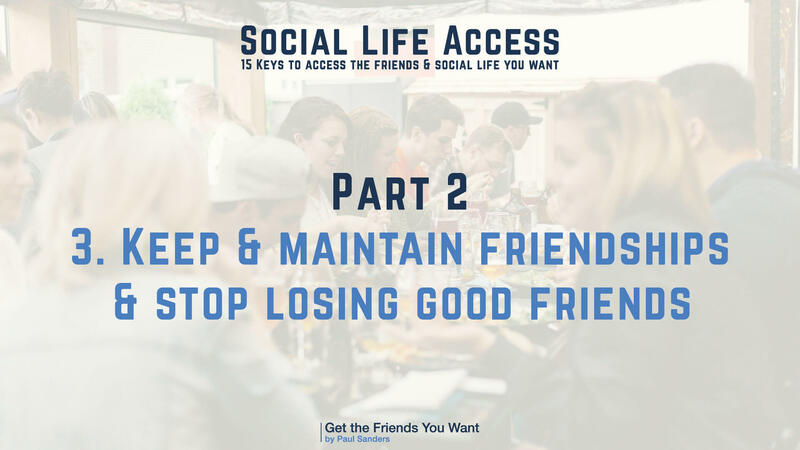 …have you ever been in the socializing hamster wheel – where you socialize, make friends, and as soon as you start to become close friends… they drift away and disappear! And you had to go back to square 1 – meeting strangers again? …have you ever had enough of meaningless, superficial friendships, that you wondered if you’ll ever have best friends again for the rest of your life? Have you ever wondered if honest and loyal people still exist? And wondered if only you could get a couple or so very good friends, who’ll be there for you when you need them, who you can trust, who’ll support you emotionally,… and with whom you can have amazing adventures, and mostly just meaningful discussions and share a few laughs!… but then wondered if that will ever happen for you? Have you ever felt that you’re the being responsible… you’re doing your work and what’s required of you, you’re putting in the effort to succeed… and yet you never get to enjoy the FUN part of life? The part where you can actually take a break and enjoy quality time with some great friends? Have you ever felt that your life was all work – no fun!? Have you ever thought that you could be much more successful, if you had friends and people believing in you, helping you with connections, information, and just straight up pep talk? But No! You don’t have those, so “it’s you against the world”? Have you ever felt that those around you (spouse or boyfriend/girlfriend, family, kids, or co-workers… or even neighbors! )… would lose respect for you if they just knew how isolated and unsuccessful in the social world you were? I sure have been there, I spent many, many, years in lonely-town. The point is this… being lonely and friendless is MADDENING. It feels UNFAIR. It feels so bad that it can make you feel physically sick to your stomach! As I was growing up, I felt that I will probably “die in my own arms.” Seriously, it wasn’t funny. I was socially awkward, shy, and nervous around others, and felt that I’ll always be outside… “the club” – I didn’t know what to do or where to start. I was a geek before it was cool, and I was an introvert before anybody around me knew that word existed… let alone understand it or understand me! Low and behold, I had to do something about it. So, sure I read “How to make friends and influence people.” That was nice advice from the ’30s… but it was vague! I looked online, and all I found was advice from people who were born social who were talking about how “you should smile and be agreeable,” or I found quick hashed articles written by people who couldn’t care less. It was hit and miss, it barely worked, and it sure didn’t make me any decent friends! Then I started meeting a few interesting people… interesting because they were travelers. They were expatriates. They travel a lot and see the world. What made them even more interesting to me was that they could come into town, and create a new social circle, in a matter of a month! Many times, it took them just a couple of weeks to create a whole new social circle. I started applying what I saw them do. I learned how they got interested in others, how they got others interested in them, how they made the conversation flow naturally, how they twisted conversations from the serious to the funny, and from the funny to the interesting and exciting, I saw them create new friendships from scratch, making friendships mean something, and manage a whole new social life without breaking a sweat. I did the same, I started getting results, I started making friends, joining existing groups of friends, and creating new ones. I was finally happily social, I was finally there… then it was taken away from me. As soon as I had too much work, as soon as I stopped “working” on my social life, it stopped working… it was as if it was on life support, the moment I stopped investing huge amounts of time building friendships and staying in touch… my social life died off. It just took too much work to maintain! The trouble is, their advice was all over the place. I could apply some of it, but what really made a difference was seeing them socialize in the real world. That’s where the golden lessons were. I started studying social skills, friendship, and social life, like a scientist… maybe like a National Geographic photographer, patiently observing the highly socially skilled human in her natural habitat: dinners, receptions, bars, barbecues, events, as well as just pizza and beers at home or just talking to friends around coffee! It was a great ride. I started getting the real lessons and taking lots of notes in my journal. And now the results were consistent. My social skills became reliable. In the past, my social skills used to only work when the situation was perfect: I was I a perfect mood, I was with the right people, the music was good, the context and the location were good… but truly having social skills means that you have them everywhere and anywhere. Whenever I wanted or needed to be social, I could be. Whenever I want to make nice, or I wanted to create a friendship, I just do it. No matter what the situation is, my social skills became reliable. Long story short, I went on to start teaching this stuff to my friends, they started getting consistent results, themselves. I started teaching, coaching, and writing about it, then hundreds, thousands, then tens of thousands of people benefited from my days of socializing struggle. I couldn’t be more grateful. The thing… you can, too. I believe in you! And your life is too important to have just the work and responsibilities in it. You deserve to have a little fun and enjoy yourself. You deserve to have those types of friends that can make you feel like a happy kid again. I’m talking about those friends who believe in you and like you for who you are. “Hi Paul! I had a great dinner yesterday and wanted to share… I was meeting with my boyfriend’s new colleagues and their spouses and was nervous about it at first (they are very successful and well-traveled, and he was so happy to be out with them, he definitely wants them to become friends of ours, especially the couples). I didn’t want to do or say anything stupid – or just be quiet and alienate them… and blow it. But I remembered what you said about “Blending In” last time we spoke… I focused on smiling, being happy I’m there, enjoying the food,… and just being glad I’m there in general. I then started looking and listening! I avoided getting in my head by FOCUSING on others; focusing on what they say; focusing on who they are… and asking questions and being interested. I’m glad I did because that made everyone around me open up more, share more stories, and share more laughs. Even the guy my boyfriend respects the most – and who looked most smug at first, opened up and he turned out to be a very nice guy – not pretentious at all! It was just in my head! Anyway, I also focused on finding things in common, and every time I did… I mentioned them ! it was so easy! Simple things, simple words, it made all the difference! As I said, the techniques are the same… they can work anywhere… they’re the shortest distance between you and the social circles and friends you’d like to have in your life. As they worked for me, for others, they can work for you. The key is to make your social skills reliable. Get the right method, the right principles, and techniques, and then apply them… and make them part of your habits. Each time you meet new people you’re interested in… you apply the methods automatically, without even thinking about it… and have a great time while meeting new people and making friends. YES! It will no longer feel like work, you’ll actually be enjoying yourself! Here are 3 things I discovered that changed my results in friendship & social life almost overnight that you can start using. You’ll see instant results. Did you know that most of the social experiences & friendships you miss out on… are due to the fact that you don’t even show up? Sounds simple – it’s true. Am I going to be the only one who’s alone?… Are the people there all alike, and I’m gonna be the one who’s different? The thing is… by thinking like that, you’re making that particular event or social gathering opportunity, into a monster. Into something so big you have to prepare for… like climbing a mountain. In simple terms, you’re making a big deal out of ONE SOCIAL EXPERIENCE. It doesn’t matter that much. People leave early from social gatherings all the time – it’s completely normal. But when you lower the expectation and know that one evening or one dinner or drink… has no major influence on your life… it’s no big deal… your attitude changes. You realize that you’re going to be fine. You won’t see that social gathering a “major event” or that it’s a big deal… worst-case scenario: enjoy yourself for half an hour to an hour and then leave. That will make you feel much more confident and in control. At what will you gain from it? Well, congrats! You’re at least heating the engine of your socializing! You’ll be much more ready and relaxed next time. Well done! Let’s say you’re talking to a group of potential friends… if you’re afraid you’re not gonna be able to keep up with a group convo – afraid you’re going to be out of sync, or not say anything relevant, or afraid you’ll get interrupted just as you speak or break the vibe by not talking at the right time… look up! Look at them… each time someone starts talking, look at them. No seriously, look up. Don’t look down, don’t let your eyes wander around… look up… look at the person who’s talking. When you do that, you always know who’s finished talking, who’s about to talk, who’s about to say something funny, and who’s about to tell a story. This activates your natural wit. You pick up on where the convo is going, you’re able to participate, contribute your opinions, stuff you heard about, or tell your stories… and each time you’ll be in-sync, on-point, and in the vibe. Just because you look up, and pay attention to who’s talking… instead of looking down. If you let your mind wander around, and look down while you think of something to say, then that’s likely to fail. When you finally think of something to say, they’ll already be about something else. 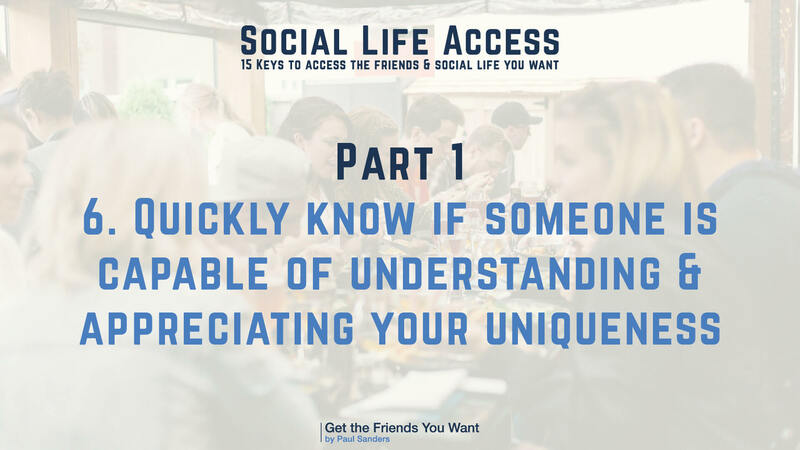 Again, just by looking up, you’ll have a whole different social experience: people will feel more connected to you, which makes them more likely to become your friends. Small but important details make all the difference. Before you can be “close friends” you need to be “casual friends” first… but it can take some time to create a few casual friends, have fun and socialize with them… until you find those great friends you’ll want to keep for years. So how do you do it faster? Well, the reason it may take you time is that you’re focusing on building one casual friendship at a time. You spend time contacting them, scheduling, meeting up, etc… and you do it with each and every potential friend. You need to focus on groups! Create groups instead, and hang out with people in the context of groups. Even if they’re just groups of three, it’s still much better and faster. Plus, it’s way harder to get someone to hang out with you alone (when they don’t know you that much, and there’s that doubt about – will we get along? Will have things to say?… yes! They’re asking themselves that, too! They’re wondering if they’ll be comfortable with someone they barely know). When you invite people to group outings, it’s more efficient… and easier: less pressure on each person to make conversation and be interesting. Again,… focus on groups, hang out in groups – especially when you’re just getting know people. It’s all about small details and small tweaks that change your social life. 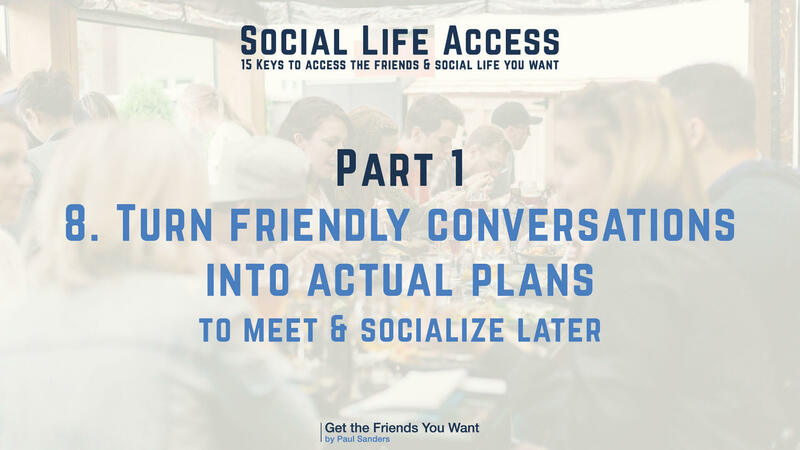 The key is to make it easier for you to actually socialize… the easier it is to do… the more often you’ll socialize, and the more friends, and more fun you’ll have. I had my doubts in the past, I truly thought this is next to impossible, and I’ll always be lonely. I thought it’s just destiny: some people are social and others are not! Well, I’m lucky I found out that that was all in my head. Later on, I found that according to social-neuroscientists, loneliness makes you think that way. It makes you think anybody you try and befriend will reject you. It makes you think that you’re in danger of being rejected and humiliated all the time. So you keep to yourself and stay in that cycle. You have to trust yourself that you can do this and that you can get out of loneliness – even if part of you still has doubts. I always thought that some people got in the clubs, and some didn’t. And that’s that. Until I started learning, and applying social skills, and then condensing them into simple, easy-to-apply concepts, that feel natural. I developed friendships with people who can travel halfway around the world to come and help me if I was in need help – or come celebrate with me if I invite them to something important. These friends who are willing to help me in any way I want; and I’m just grateful I don’t need much help, but it’s there if I needed it. If I ever needed a job, I’ll get it, it’s there, many friends would hire me on the spot. They know me, they know which skills I have, but most importantly, they trust me. If I want to go into a new business area – there are friends who will be more than happy to help me get started, build, and thrive. If I wanted to move to a new place in the world, my friends and contacts will provide help, information, and local contacts, to make my transition as smooth as possible. Again, I rarely ask for any serious help, but it’s there if I ever need it. And for that, I’m grateful. I taught him how he can’t just go from trusting too fast, to not trusting at all. I taught him how trust should be earned, and that he had to take it one step at a time. Trust is not an on/off button, it’s like a volume button. The more the person proves their trustworthiness, the more you can trust them. That lesson alone was enough to put him back on track, networking, making friends, and being happily social again. He was careful, he didn’t get taken advantage of by friends anymore, but still, he was very open and able to socialize. I didn’t imagine I could be helping even people in their 60’s! I thought they’d have twice my life experience. Then I realize that social skills are important, you need to invest at least some time to learn them. They don’t come on their own. I also helped people who went to a new college and felt that their alone in this world… they had the reputation of being a loner… they thought they could never “break out” of that reputation of “that quiet loner” but now it’s all in the past, they’re having a great college experience and they don’t feel that they’re wasting their college years by not learning the people skills they’ll desperately need in the future. I helped people who were spending so much time dating, they could never find the right person… guess what? The best people you can date and fall in love with are probably friends of friends. So they found their life partners that way. I always say that if you have a great social circle, people filter out the bad, and introduce you to those who are worth it. I helped people who are married bring new joy to their lives by meeting up with other successful, happy couples… and sometimes, their kids become friends too. I made sure that my methods are easily applicable. I like efficiency. I like efficiency, I don’t like techniques and socializing principles that feel like a part-time job. I like things that work, things that bring you the right friends, the best friends, but take the least amount of time to learn, apply, and integrate into your attitude. Many of them found way better jobs and way better business opportunities through friends, some found their life partners through friends, and some found amazing friends who changed their outlook on life and expanded and enriched their lives. What specific emotions are involved and how to help create them, what types of friendships are the best for you, depending on what you want to get from the friendship; what types of social life structures you can have and how to build them, and many other concepts. I spent hundreds of hours reading, collecting, and arranging scientific research and findings – to connect what I learned in the real world to the science. I found the link between the “book-smarts” and “street-smarts” of building your social life. In this program, I wanted to do something special. See, when building your social life, and building friendships, you go through important steps. These are important moments in your social life. Each step requires a social skill. If you have the social skill, you go through the step and get to the next one. If you don’t have the skill, you don’t go through it and have to go back all the way to the start. This is why I wanted to give you the social skills for these important moments. To go from getting out of the house, all the way to managing a thriving social life. You’ll have the “keys” to the “doors” separating you from starting from scratch all the way to having exactly the types of friends and type of social life you want. First, I condensed all my best techniques and methods, into written notes. Then I rewrote them many times over to sharpen them. I wanted to condense the best techniques and the shortest… shortcuts. I took these notes that I spent hundreds of hours putting together and assembled them into modules. 15 modules, in three parts (3 major categories of socializing). Then I took all those written modules and decided to put them on video. I spent many hours (I stopped counting at that point, probably hundreds of hours again)… I spent that time recording, and re-recording myself teaching those concepts. My assistant Debi and I had to learn how to edit video semi-professionally, and cut, and paste, and edit, and add visuals, and quotes… it was a crazy ride. I then sent the whole thing to a professional who charges thousands per hour to edit video, so he can put the final touches. The program was ready! We then prepared the exercises, the transcripts, and the manuals. We then uploaded the whole thing to the cloud, so you can access it 24/7 from whenever you want. It was a hell of a ride! I had to put myself out there. I’m not a public speaker. This is the first time I do a video program. And it’s the first time anybody took this area of life this seriously. It’s time for us all to take seriously enough and invest enough time learning it because it’s worth it. Big time. 15 video modules, in three major parts – 3 categories of socializing. It’s over 10 hours of HD video. You get the audio versions as well, so you can listen while you’re on the go. Watch or listen on your computer or smartphone. You could go through the whole thing in a week if you want. I recommend you go through it multiple times. Apply, learn again, listen or watch again, then go apply the concepts again. You should go back and forth. If you do that, your social life will change faster than you can imagine. If you already have friends, you’ll get to the next level. If you want to access better quality people, people who are more successful, people who are wiser, smarter, or just plain more interesting and fun, then this will help you do that. 30 full days of unlimited access to watch the program, try my tools & see the results. Get Ready… it’s a long list! How people who know you have an idea of the best possible social life you can build. And how that idea is way inferior to what you can get, what you’re ready for, and what you deserve. Why it’s important to build a social life that’s on your own terms and get the right friends for you. And how to achieve it. How your social skills give you access to influential people, to friends, and to social circles. How you might be one friendship away from opening up access to a whole social circle, full of interesting and supportive people. Why people neglect their social life and treat it as an “accessory” instead of an essential piece of their life – and how that makes them miserable. And how you can avoid being like them. How to be at least three times more successful and get there at least three times faster, by connecting with the right people. Why successful people take proactive steps to build their social lives – while others think that it’s not worth it. You’ll know what successful people understand about friendship and why they invest a lot of time and money to build even more friendships – even if they don’t have a lot of free time. Why your social life can get you better dates if you’re single, or improve your relationship or marriage you’re not single. How your social life can help you have more impact and reach more people if you have a special message you want to spread out or you want to have more influence. In a way, it helps your ideas travel faster and touch more people. How to set achievable goals for your social life and friendships. How to be much more social when and only when you want to… in other words, being social doesn’t become an obligation or an overwhelming thing you do even if you don’t feel like it. How to take the best techniques and methods for socializing and friendship building… and drive them into your unconscious. Then you can start using them without having to think about them. That way you can enjoy yourself more and be more spontaneous instead of worrying about what to do when you’re with people. Why your social skills should be always ready to fire. How to make sure your social skills work every time… even if you’re not in the best mood, when you’re with people who are impressive, intimidating, and when the overall conditions aren’t perfect. 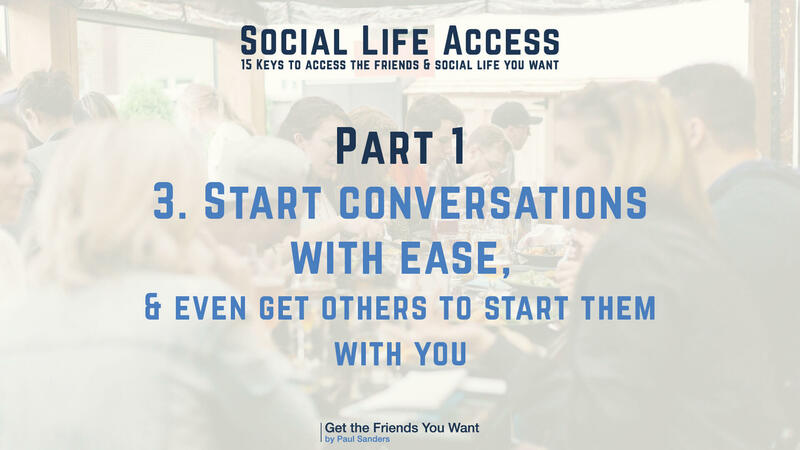 The first steps in building your social life are kind of “make or break.” if you make any mistake with people you’re just getting to know, there is pretty much no recovering – you have to go out meet new ones. If you make a mistake with an actual friend, you can recover from it. But with entirely new people, any mistake can make the situation awkward enough to destroy any chances of friendship. This is why this part is longer than the others. The objective is to make sure that these critical steps are as smooth and successful as possible. Why you may feel out of place when going to social gatherings with people who are more experienced, successful, or evolved, than who you’re used to socializing with. Why you might feel that everyone there is going to be too different from you. And how to overcome those feelings so you’re able to have fun and show the fun parts of your personality. How to stop thoughts like “Will I belong with these people? Am I cool enough? Am I interesting enough? Am I too different? Will they all know each other and I’ll be the only stranger?…” from ruining your mood and making you feel like a fraud. How to feel comfortable about going to a social gathering, before you even get there. How to “take it easy” when going to socialize, if you’re used to stressing about socializing with interesting people. A simple mindset that supercharges your confidence as you enter a social gathering, a friendly party, or just a dinner between friends and friends of friends. This will make you realize why people actually want you around and want to be your friend. How to feel at home, as you enter a room full of confident-looking strangers. Why there is a part of you that resists feeling part of a group – this happens especially to confident, intelligent people – and how to make peace with that part of you and give yourself permission to relax, enjoy yourself and socialize with any crowd. How to be “in the vibe”… “on the same wavelength”… “in-sync and fit right in”… with any crowd or group of people. 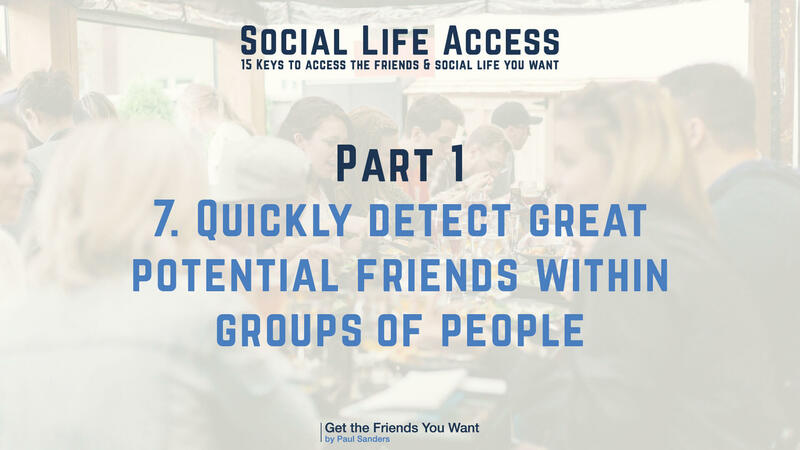 How to quickly detect the social dynamics in any social setting, and act according to them… so you never feel overwhelmed or isolated from the people around you. How to drop the “me vs. them” mentality that’s murdering your chances of making friends. How to turn any social hesitation or shyness you have into a social skill. Seriously. How social hesitation and shyness can be used as an asset, instead of something you’re ashamed of. How socially successful people use a form of social hesitation to make more friends and get inside social circles of people who would otherwise reject them. Why getting rid of your shyness entirely (to a 0% level) is one of the worst things you can do… and what to do instead. 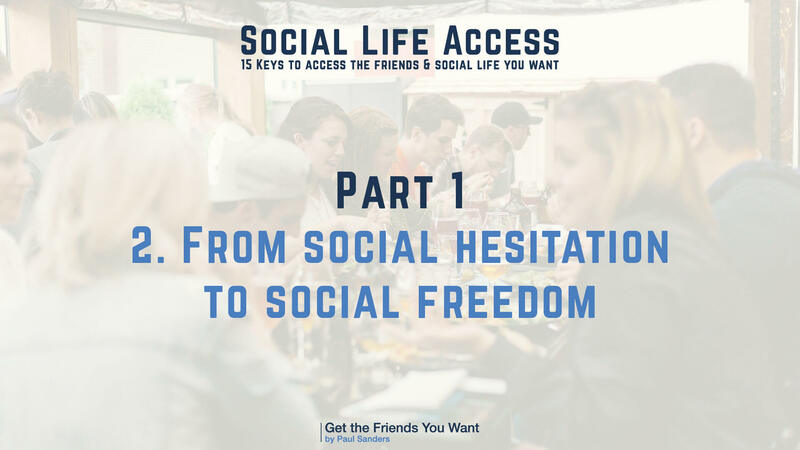 How to reduce your hesitation to the right level… a step-by-step process of making sure you can be socially free in any type of social situation. How to reduce shyness faster. This process has been used by thousands of people and it works every time. You’re going to learn to make it work faster for you. How to speed it up so you save months or years of your life from trial and error – and get to enjoy your new social life much sooner than most people are able to. How to behave in entirely new ways when socializing, without feeling like you’re doing something weird, or something you’re not used to doing. How to naturally try new social behavior when you want. Why socially successful people look so confident and socially polished… and how you can do the same. How the skill of starting conversations helps you even with existing friends and friends of friends. How to start conversations that aren’t easily interrupted, where the other person or group is as engaged and interested as you are. Without forcing it, and without using any clever lines or smug-sounding words. How to start conversations the natural way. How socially successful people start conversations. What to say after you introduce yourself to make the conversation stick. How to make sure the conversation doesn’t break apart just after a few seconds of back and forth. How to bring a new twist to the conversation that makes others stop their train of thoughts, turn toward you completely, get engaged, open their eyes and ears, and smile, as they realize that they’re gonna have much more fun talking to you. How to re-start a conversation with people you’re meeting for the first time… in case you need to go take a call or order a drink and come back. How to snap people right off their bored mood when you first talk to them. 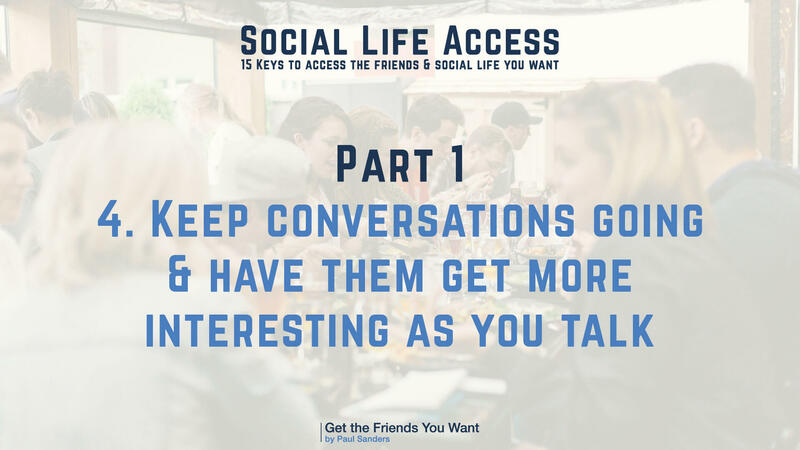 How to start conversations with existing friends… and strengthen your existing relationship, even if you’re in a crowded room where you don’t get all the time you need to reconnect. How to use what’s happening around you to create interesting conversations. How to quickly transition to much more interesting topics and get people to open up faster. How to get to connect on a personal level… even in professional events where people feel like they have to be cold and serious. A simple reframe that makes people quickly talk about their present, their past, and their future… which makes them feel like they know you well, and that you get it. It makes them already imagine that they should get a drink or go to a long dinner with you. What subtle signals to give so others see you as more approachable and start conversations with you to get to know you. How to find things in common with people right as you start talking… and much more. How to avoid having conversations dying too early. How to make the right type of small talk that allows for deeper, more meaningful conversations later. What to do so people open up more and more to you, instead of keeping their guard up and staying at a distance. How to “cover a lot of ground” in conversation so you quickly figure out what you have in common with who you’re talking to. The right way to exchange pleasantries with existing friends. This creates the sort of discussion that lets them get to the important topics that they want to discuss. Topics they wouldn’t reveal to you otherwise. What to do when people aren’t really in the mood for meaningful conversations… they just wanna have fun for a change – which sometimes, that’s what you’ll want, too. Discover why you may be at loss for words… at the exactly the wrong time. And how to stop that from happening again, especially when you’re talking to important or interesting people. How to have an unlimited amount of topics to discuss, always have something to say about anything… as long as you want to talk, you’ll have something to say. This may actually make you sound more experienced in life than you’re actually are. How to get from any subject… to any other subject. Sometimes, it’s a good idea to change the subject, so this will show you how to always have segues. Other times, the subject just isn’t interesting anymore, and you’ll know how to kick off another topic and have people enjoy discussing the new one you bring up. 99% of people don’t know this secret to making the conversation a lot more interesting… whether you’re talking to your barber or hairdresser, your neighbor, or the most important and successful person you’ve ever met… this secret makes them remember the unique conversation they had with you… and remember that they can never be bored with you. How to have others’ attention and get them focused on talking to you… instead of being distracted by their phones, or looking around, or wondering who else is in there. If you follow the steps in this module, more people will think that “you get it”… when they talk to you for the first time. How to make someone realize that you’re able to see what’s unique about them. Why people are desperate to meet someone who can actually listen… instead of just waiting for them to stop talking. And how to that without them thinking that you’re only listening because you have nothing else to contribute. How to talk about the #1 most interesting subject for people… themselves! And how to do that in a way that is not only natural, non-creepy, and not sound like an interview… but in a way that’s also fun for you! 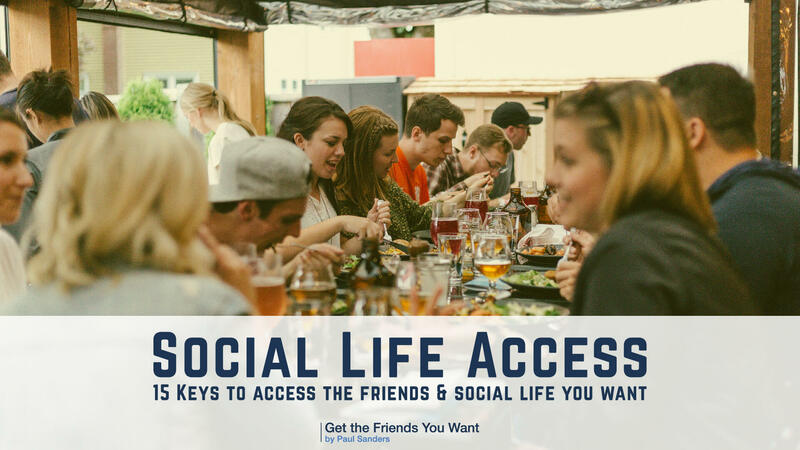 A way to find out what potential friends are eager to share about their life. Once you know that, I share with you how you can let them expand on it, so you get to know them faster. How to connect with someone at a logical and emotionally. 3 techniques you can use in order to uncover the deep motivations of someone – figure out why they do what they do, what they’re passionate about, and help them express themselves more fully. How to prove that you get them – beyond any shadow of a doubt. Exactly when to “wrap up” the conversation about them so it doesn’t drag forever. What to do so they stop talking about themselves and become eager to talk about you. When you prove that you get it, now they want to know you. A science-based checklist for being more likable that has absolutely nothing to do with changing who you are. How to talk about yourself directly, when you want, and indirectly when you what that instead. A way to present who you are that makes anyone listening relate to you. A quick tip to talk about yourself even when the conditions are far from ideal: loud music, too many people around, not enough time, etc. With this technique, you have no need for “a first impression routine” or an “elevator pitch” that all sound re-hashed and pre-prepared. How highly socially skilled people talk about themselves the way they want, depending on their mood, and what they feel like talking about. This quickly shows you if the other person can actually get you, or not. That way, you don’t have to invest time in people who are too selfish or too distracted to listen and understand. Why you should choose which parts and aspects of your life and history to lead with when getting to know people. And how that choice makes you feel socially free, instead of imprisoned by the title of your job – as if it’s a stamp on your forehead. Avoid being quickly labeled as “just another [insert your occupation here]” & how to help people see more in you than your job title. How to talk about yourself, and get people to understand you and relate to you… without putting pressure or too much attention on you, when that’s not what you want. How to discreetly and indirectly present who you are to others… and have them understand… without you talking about yourself directly at all. Sometimes, you just don’t feel like being the center of attention, or the be the topic of discussion. This section will show you how. How to know if you’re talking to a good potential friend – figure out if you’ll be a good match and a good fit, before you invest time and effort. That way, all your future efforts will be put into friendships that are worth it, and those who will actually work out. Simple questions to ask to accurately predict if a friendship will work. Figure out if someone is ready for friendship… and aren’t just being friendly and polite. Discover the friendship matrix: and open yourself to types of friendships most people aren’t even aware they can have. Understand which interactions to have to influence which type of friendship you’ll have with a person or a group. Know the exact difference between casual and close friends and what to do to transition from one to the other. Which are the most important emotions when it comes to developing a friendship. Why most people fail in friendship – by not making the key differences between all the many types of friendships you can have. By acting the same way, no matter what the type of friendship is, they keep failing and ruining those friendships. 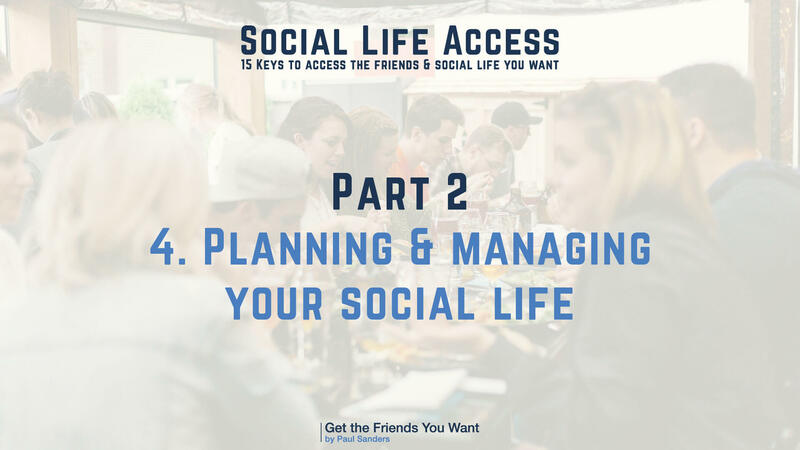 Discover the types of social life structures you can have – so you can choose the one that works for you. Know what types of friends are the right ones for you, depending on your goals, and how to recognize even when you’re with a big group – and you don’t have much time to think. You can just automatically pick them out in little or no time. How to know which kinds of friends you want, without being too rigid and missing out on social circles you didn’t even think you could access when setting your goals. If you’re sick of having a great time with people… then never see them again, this module will show you what to do to avoid that. Know why most people don’t really mean it when they say “let’s stay in touch” or “we should hang out sometime.” What to do before you exchange contact information, so when people say “We should definitely hang out”… they actually mean it. How to make sure people feel natural about meeting you in the future. Avoid making it sound forced. Get rid of the natural, but uncomfortable resistance that comes for people as they’re making new friends. How to know if someone really has time to socialize in the future. If you know this, you will no longer waste your time trying to befriend people who just don’t have time. It’s always better if you know beforehand, instead of getting disappointed and feeling rejected. A simple test you can do in conversation, that tells you if the other person is also interested in meeting you in the future. You can do this, without directly asking for their contact information or revealing that you’re interested in being friends. Why finding commonalities is not enough to make it make sense to hang out later… and what to do about it. How to make exchanging contact information (phone number, facebook, etc.) as smooth and natural as possible. How to exchange contact information with someone you’ve had a great conversation with… but also how to do it when you didn’t get a chance to talk, but you still sense that they could be a good potential friend. A full proof way to make others think about what you could be doing together in the future… which makes them want to suggest it and ask for your contact information. This part is about what to do after you go home, with multiple numbers and social media of potential friends. The aim here is to make the whole process from maybe becoming friends to actual friends, as smooth as possible. How to take control of how you make plans with people, instead of feeling like you can control anything. How to add more people to your social life – and do it much faster than the rate at which you’re losing friends: they move, they become too busy, etc. A simple way to avoid wasting time making plans with people who never show up to anything – and what to do instead. Make plans this way and you’ll never feel like you’re “asking” people to hang out with you. How making plans successfully is actually easier and effortless. This is especially the case when you’re dealing with successful, interesting, and fun people. How you can stay in touch with many people at the same time, while barely making an effort. How to make sure people never forget about you – and remember exactly when they’ve met you, why it was interesting, and get excited about meeting again. How to make it very comfortable and natural for people to just get out of the house and come meet you. You can actually make it feel natural to hang out with you for the first time. If you do it this way, meeting you will not feel like they’re stepping out of their comfort zone. How to make plans and hang out with people you didn’t get enough time to get to know just yet. How to make get friends of friends to hang out with you – while avoiding any awkwardness or jealousy from the friend who introduced you. How to decide which days of the week to meet new potential friends, depending on where and how you met them the first time. Simple ways you can always have great ideas for what to do with friends and potential friends. The quickest way to create an entirely new social circle. There is probably nothing that works faster than this technique. Apply it and you’ll have an entirely new group of friends within one week or two. Use this especially if you want to breath new life to your social life or if you’re starting from scratch and want fast results. How to make sure social media is helping your social life instead of distracting and discouraging you from meeting with people. Remember when you were a kid and all it took to make a new friend was to ask them “Hey, do you wanna be friends?”… this is the adult version of that. This Friendship Method should be taught in schools and colleges. It’s exactly what happens between two adults before they become friends. Use it, and you’ll be able to make new friends more efficiently and predictably than anyone you know. A simple method to open up to people at your own pace, that neither creeps them out; nor make them think you’re too distant and cold to be a friend. How to avoid coming across as too logical when socializing. How to get people to lighten up and get ready for some friend-making chit-chat. If you do this, you make yourself feel like you can have fun and take a break from the stress and seriousness of your responsibilities. How to make people feel that they’re secure with you and have them put their cautious guard down. How to make your new socializing schedule plug-in with a new friend’s existing schedule. How to make work so easily that you’re constantly planning and scheduling. That way, they include you in their social habits. How to find things in common that significant enough to make a new friendship feel like a no-brainer for both you and the other person or group. “Normal” commonalities are great, they still work, but this is the next level. A simple exercise that helps you overcome any issue you have with trust. Do this, and you’ll not only be careful and not trust pretty much anyone… but also be open enough so you’re not alienating great potential friends. A simple conversation sequence that makes others think you’re one of those they can keep in their network (if not as a best friend) forever. A technique to make friends intentionally, instead of leaving them to chance. How to get off the friendship hamster-wheel where you make friendships, invest time and effort in them, and just as you start to become close… they disappear! How to predict what tensions and ups and downs of friendship before they happen. Exactly what to do when you see that friendship starts to deteriorate, so you can save it before it’s too late. Friendship dilemmas that can break down your friendships, and how to deal with. Why friendship can be fragile if you don’t take these steps to strengthen it. How to deal with situations where your friends one thing from the friendship,… but you want something else. What to do when you’re feeling rejected, mocked, minimized, annoyed, unconsidered, neglected, or criticized… so you’re able to deal with it, instead of just being sad and doing nothing. By the way, I’ll also show you how to avoid making good friends feel that way by mistake. How to behave so friendship problems don’t come up in the first place. How to keep your friendship at the high-quality level. How to get to what’s worth it: lifelong friends that will support you, help you, understand you, appreciate and respect you, and root for you no matter what. How to take out the clutter and distraction from managing your social life: staying in touch, touching base, making plans, going out, taking care of good friendships, etc. how to manage a thriving social life with clarity instead of confusion. Build a social life that’s in tune with your values, principles, and life goals. How to build a social life even if you’re busy and have little to no time to concentrate on making friends. Remember, highly successful people don’t have much free time, but they still have great social lives. We explore how they do it in this section. A way to make sure that your social life boosts your career or business, supports your other relationships, make you happier, and helps you take any adventures you dream of having… and make them real. How to have a social life that supports you intellectually, emotionally, and physically. Why most job and business opportunities are found through friends. How your life problems seem smaller and hurt you less when you have the right friends. How to figure out who can help you get to the next level in your life faster and easier. How to take advantage of your existing schedule and make it more social… while protecting your “me time”. A clear map of your social life that can easily make it ten times clearer and easier to see your social life, where it is, and always know what to do next to make it better. This gives you control over where your social life is going. How to never neglect the right people, whether they’re lifelong close friends, very interesting casual friends, or business and career contacts. Who the interesting people are in a small town and how to find them… if you live in a larger city, this will also show you how to sift through the random… and get to the right people faster. How to maintain a constant stream of new potential friends, so your social life is never stagnant. Most of socializing happens within groups,… sometimes just groups of three friends, sometimes many more. In this part, I show you how to never be intimidated by groups again, and how to have fun within them instead. How to talk to a group without feeling like you’re competing for attention. How to always be in sync with what is being said, and contribute with interesting comebacks of your own. Do this and most people will just see you as a very positive person who they’re glad they have in their group. Why having group conversations with people who are older than you, too different, more successful, more experience, and overall have great lives,… can be actually easier than talking to people who are less successful than you. What to do so you detect what is said, behind what is said, in a group conversation, even if you’re just getting to know the people in the group. Exactly when to talk more and hold the attention of the group… and when not to. If you know this, very socially successful people will not only feel comfortable with you… but will recognize you as one of their peers – they’ll respect you as they’ll see you as a highly socially skilled person. How to avoid sure people can discuss their opinions and even debate, without ruining the night for everybody else. How to participate in a group conversation even if you’re don’t know much about the subject they’re talking about. How to avoid being constantly interrupted in a conversation – even people with good intentions can interrupt you by mistake. This section helps you reduce the chances of that happening. A simple way to have a meaningful conversation with one or two people, even all the others are having light chit-chat and are being loud. This gives you the flexibility to go into deep subjects if you want to, even within a large group gathering. How to masterfully change the subject when you know it’s going in the wrong direction: for example, one friend could be feeling very uncomfortable about what’s being discussed, but you’re the only who noticed… if you know how to change the subject at that moment, you would have done a great service for the group. How to enjoy yourself more in group conversations – even if they seemed overwhelming in the past. 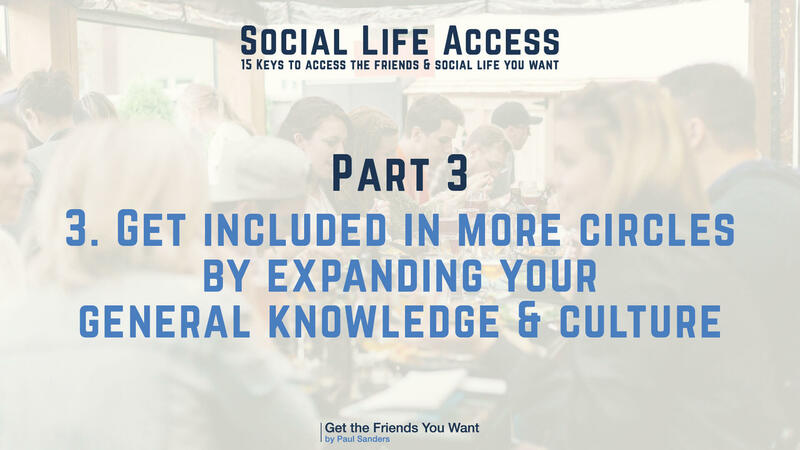 This module will show you how you can join an existing social circle – without feeling like you want something from them or having those feelings that you need them more than they need you. Why many of the best of friends you can have are already in groups – sometimes just groups of three friends. And how you can take advantage of that to build your social life. How not to feel intimidated by the overconfident attitude some people may have when they’re with their buddies. How to turn it around and have fun with them instead of feeling like they’re more intimidating than you. 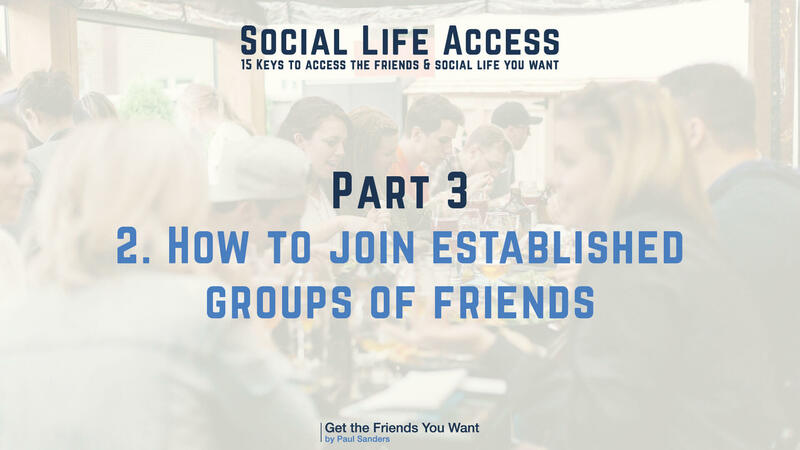 The steps to take to create your own group of friends instead of joining an existing one… and how to decide whether you should create or join a social circle. What interesting and highly successful friend groups want in a new friend, and what they don’t want. How to use this information to make sure they see you as the right kind of person they want in their group. A behavior you should always avoid to make sure you’re not rejected by that one insecure person in the group. Avoid this behavior and they’ll welcome you just as much as the confident ones. Why some groups of friends will not show you that they want you in the group, even if they do. This section will show you how you can figure that out anyway. How to behave so no one ever thinks that you’re desperate to join their group. Behave this way and they will never even dream of having power over you or feel like you need them more than they need you. How to go beyond “the games” and get to the honesty fun and enjoyment within a group of people you’re just getting to know. How to make sure that the person introducing you to their friends is proud that they did, and feels like they’ve made a great decision. How to figure out the friend group’s habits and routines, figure out who organizes the social gatherings, so you’re able to influence those habits if you want to. Why having more knowledge and culture changes your social life radically. Why people will be attracted to you and want to be around you when you use your knowledge in conversation in a non-boring, non-lecturing way. The right way to share your knowledge and experience, so more people find it interesting and how to do it enough so they find you interesting. How to accumulate more of the right knowledge, that helps you succeed socially, without becoming an expert at it. You just need to know the right amount. What being aware of different cultures adds to your personality – and why most people will just see you as one of their top most interesting friends in their life. What to do so more people… will introduce you to more people. Don’t be surprised if they introduce you to their families, because this one thing makes everybody thinks that you can relate to anyone and that they can take you anywhere. Why some people get away with more socially awkward mistakes, while others get ditched after the first awkward silence. Which topics to focus on first, as you start to expand your knowledge and culture, so you quickly start to relate to more people from the get-go. If you already have a large enough social circle, full of very inspiring, very successful and happy people, then this might not be for you. If you already have enough close friends who support you, help you, root for you, and understand who you really are, your problems and dreams, then again, this might not be for you. If you think you’ve maxed out and you’re already hanging out with the best people you could ever imagine having as friends, then this is not the program for you. If your conversations are always putting people at ease and make them want to be friends with you on the spot. If everyone who gets your contact info actually follows up and starts to invite you to their parties, then you might not need this program. If you feel that you never get as much as you give in your friendships. If your conversation and social skills only work in some situations but fall apart in others. If you have a few friends but need to get to the next level in terms of quality of friendships, quality of people, and quality of social experiences. If you’re lonely right now or just need to start from scratch and build a successful social life. If you only feel lonely sometimes, and you kind got good at making yourself forget that you have no social life, but you know that the problem won’t solve itself… and it will get worse if you don’t start taking action now. You have acquaintances, and people you meet from time to time,… but you don’t have the right friends, the people who you know you deserve, people who will accept you, appreciate you, like you, encourage you, and with whom you feel more alive, and more like yourself. If you always felt that you belong with a higher class of people, either more successful people, more fulfilled, of better quality… or just more thoughtful people. If you feel like life is passing you by because you’re not sharing it with worthwhile friends… you know that the joy of being with great friends is that one thing missing from your life… and that could make everything better. If you’re in a new town and want to create a social life,… but want it quickly, not put up with another year or even three years of loneliness before you get there. If you’re not new in town, but you’re just tired of hanging out with random people and you want to access quality people and have them as friends… and you also want to do it quickly. If you don’t want socializing to feel like a full-time job. You want to invest the little time and effort required, and do it efficiently. You want to invest just the little time and effort into socializing… that yields the most results, that get you the best friends and best fun experiences faster. If you know that your social skills are what gives you access to people. If you know that if you sharpen your social skills, they’ll open up any doors for you. If any of these apply to you, then investing in this training is probably the most valuable thing you can do right now. I don’t need to tell you whether or not you need the information that is in this program. If you need it, you already know it. This program is designed like a roadmap. 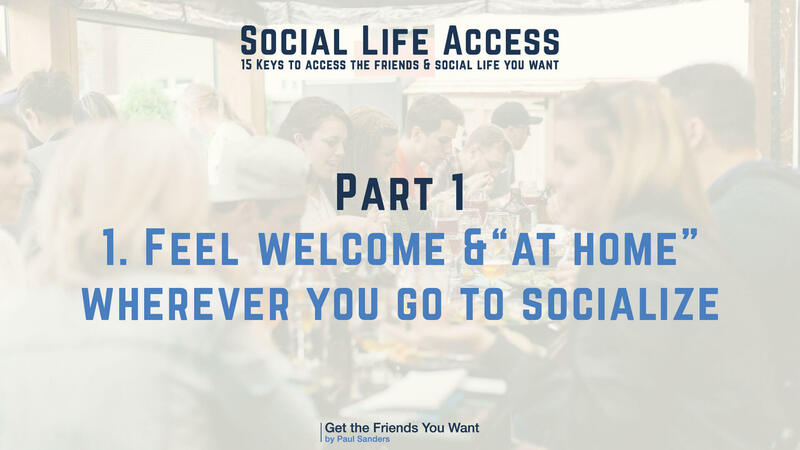 It starts from “being at home, and just dreaming about having a great social life…” all the way to “actually having friends, and easily managing a thriving social life.” It’s a step-by-step process to getting there. This program focuses on the most important social skills. The skills you need to build an amazing social life. It helps you create a social life on your own terms: your values, your principles, your goals, your preferences, and your existing schedule. Again, I love efficiency, and this is what I had in my mind as I was creating it. I want to take you from where you are now, to having a great social life, and great friends,… in as few steps as possible, and in as little time as possible. 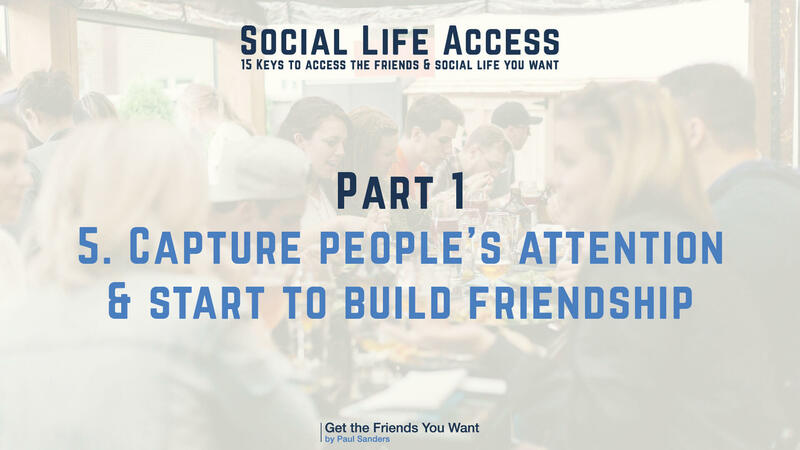 It’s the first in-depth video/audio program that takes your friendship and social life seriously… in this program, building your social life takes center stage. We uncover exactly what it takes to do it. This is not vague advice that would be nice to use. This is not “best practices” and “good habits” to have. This is a roadmap to social success and happiness. This program will give you a clear idea on how to manage your social life once you have it. With that kind of clarity, you’ll know where you are, what kind of friends you need, and what the next step is. Imagine you get busy with something for a month… and then you’re done, and you want to meet new people… you won’t be starting from scratch again, you’ll pick up from where you left off. This program shows you how to gain clarity and control over your social life. You’ll have an idea of how many close friends you have, what kind of close friends you need, what kind of activities you want to enjoy with those friends, and how to take the friendship further, so hopefully these friends become almost like family. You’ll also have a clear idea of where you are in terms of business friends, casual friends, and your larger network. You’ll know what to do next to connect up with people who open up worlds, experiences, opportunities, and the sort of fun you are missing out on right now. Over 10 hours of HD video.